1. Which type of estimate is best estimate? 2. Write the formula to calculate area of regular trapezoid? 3. What is the unit of measurement of earthwork? 4. Write any two items of works in masonry footing. 6. Write the standard size of CGI sheet. 7. Why BPT is required? 12. What does MB stands for? 14. Convert 87 inch into feet. 15. What are the deduction items? 16. 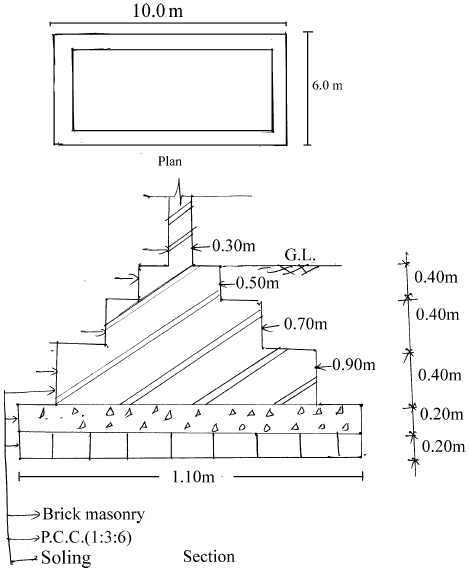 Draw a typical reinforcement details of beam. 17. Write the specification of punning. 19. Why layout is important in construction work? 20. Define site order book. 21. Write any four importances of estimate. 22. Calculate the quantity of earthwork from the given drawing. 23. Write the procedure to prepare rate analysis. 24. Draw a typical layout of components of construction site management. 25. Prepare format of log book. 26. Write the requirements for the layout works. 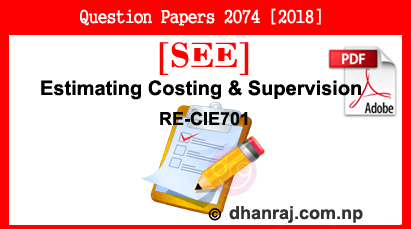 0 Response to "Estimating, Costing And Supervision | Exam Paper | 2074  | RE-CIE701 | SEE"